The company that became Alfa Romeo was founded as “Società Anonima Italiana Darracq” (SAID) in 1906 by the French automobile firm of Alexandre Darracq, with some Italian investors. 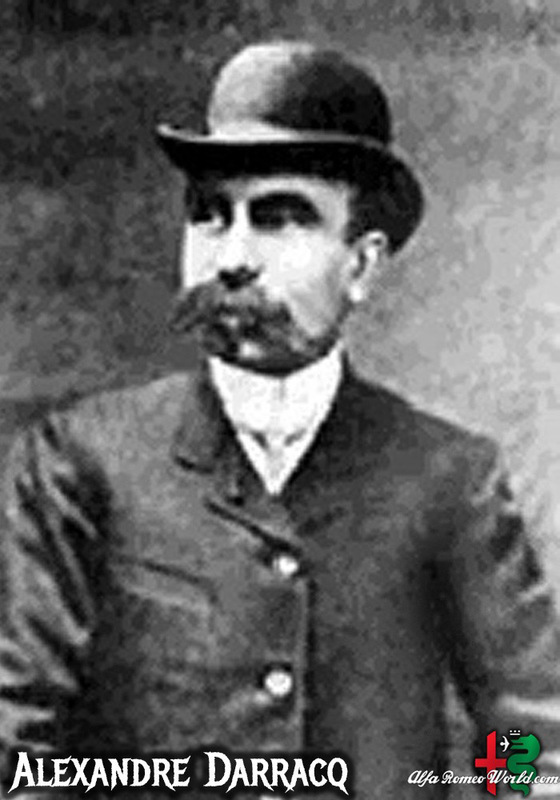 One of them, Cavaliere Ugo Stella, an aristocrat from Milan, became chairman of the SAID in 1909… The firm’s initial location was in Naples, but even before the construction of the planned factory had started, Darracq decided late in 1906 that Milan would be more suitable and accordingly a tract of land was acquired in the Milan suburb of Portello, where a new factory of 6,700 square metres was erected. 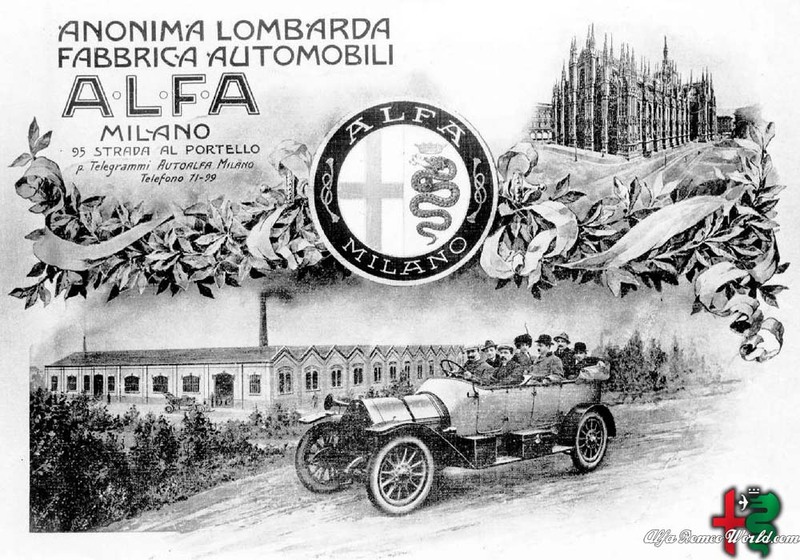 Late 1909, the Italian Darracq cars were selling slowly and Stella, with the other Italian co-investors, founded a new company named “Anonima Lombarda Fabbrica Automobili” (A.L.F.A. ), initially still in partnership with Darracq. 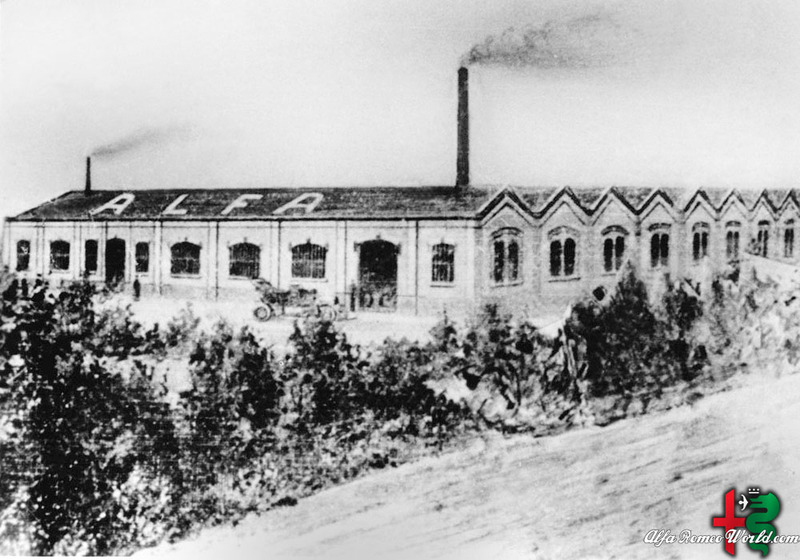 In August 1915, the company came under the direction of Neapolitan entrepreneur Nicola Romeo, who converted the factory to produce military hardware for the Italian and Allied war efforts. Munitions, aircraft engines and other components, compressors, and generators based on the company’s existing car engines were produced in a vastly enlarged factory during the war. the A.L.F.A. factory since 1915. 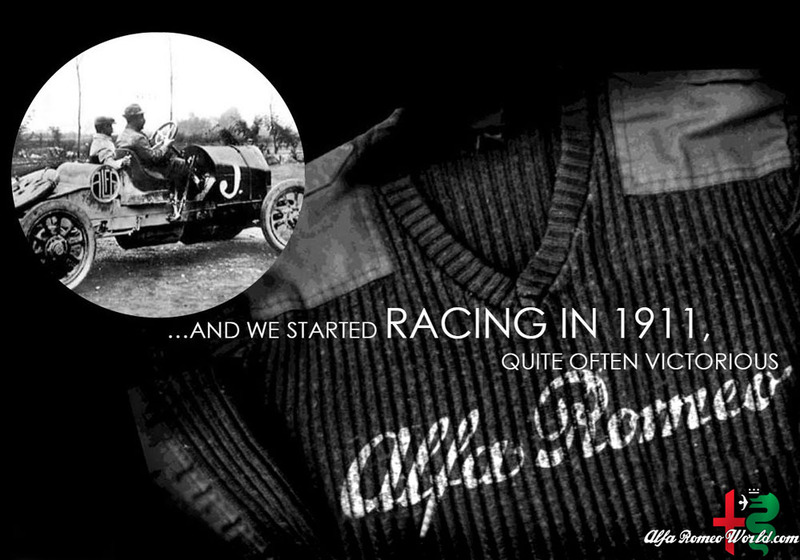 In 1920, the name of the company was changed to Alfa Romeo with the the first car to be so badged. 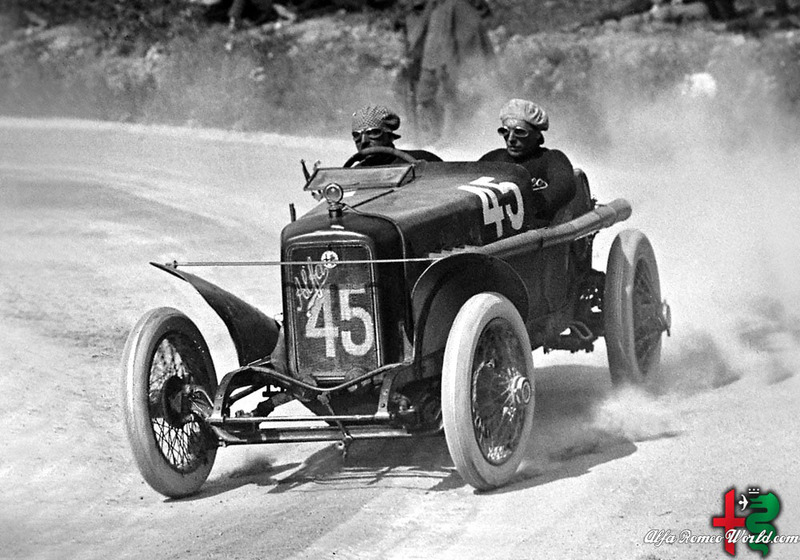 Their first success came in 1920 when Giuseppe Campari won at Mugello and continued with second place in the Targa Florio driven by Enzo Ferrari. 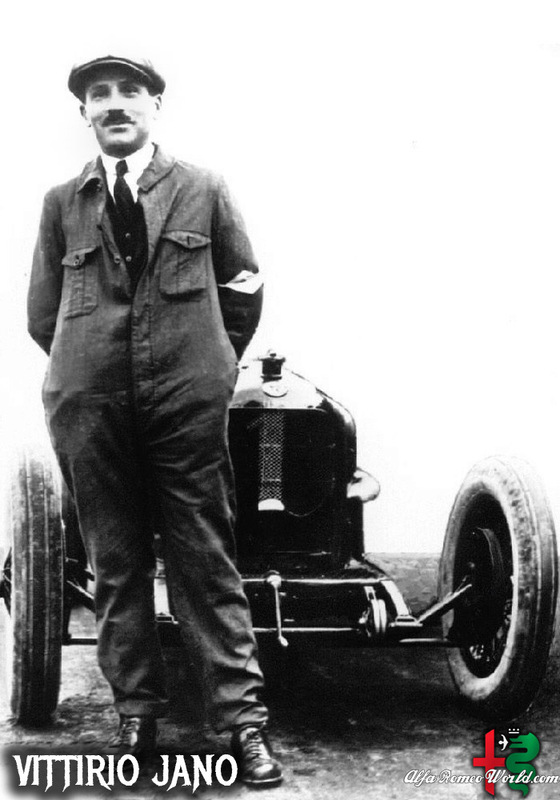 Giuseppe Merosi continued as head designer and the company continued to produce solid road cars as well as successful race cars. In the early twenties, a masterpiece by Giuseppe Merosi, the RL, was presented. Additionally, in 1923, Ugo Sivocci drove the first car with the Quadrifoglio symbol achieving a great win in the Targa Florio. After these successes, a glorious era began with Vittorio Jano, the tipo P2 and victory in the first World Championship, leading to the inclusion of the famous laurel wreath in the brand’s badge. 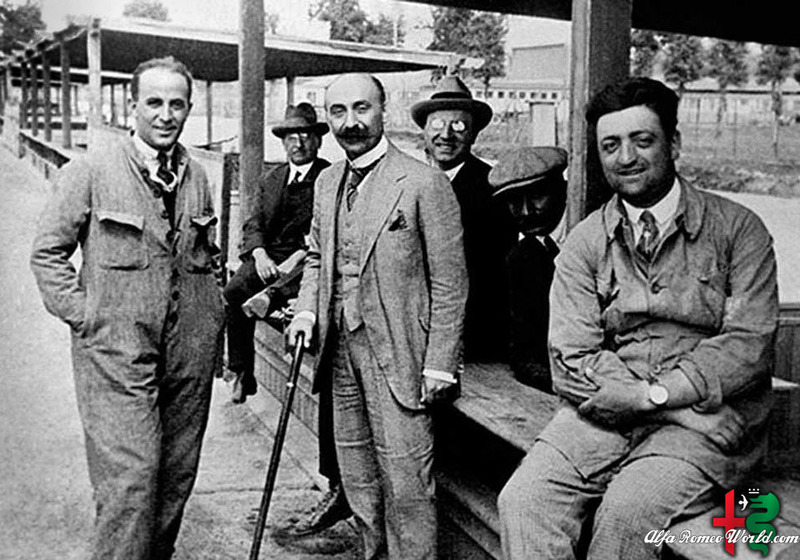 In 1923 Vittorio Jano was lured from Fiat, partly thanks to the persuasion of a young Alfa racing driver named Enzo Ferrari, to replace Merosi as chief designer at Alfa Romeo. 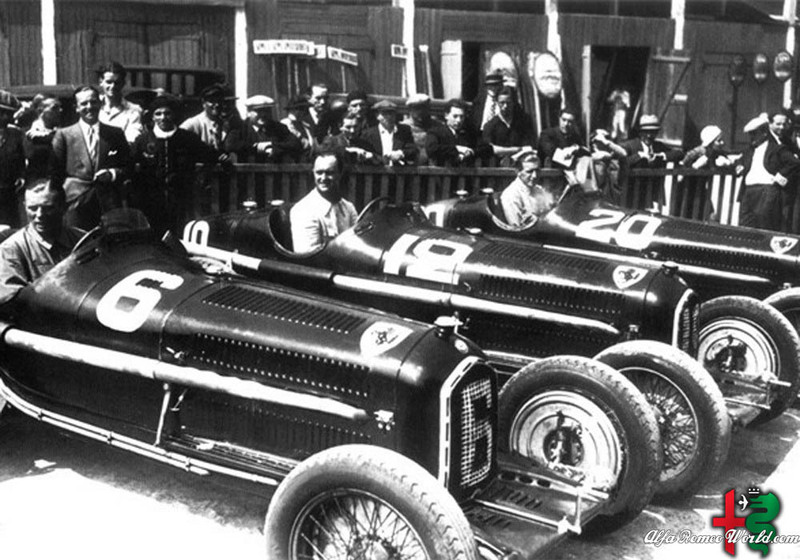 The first Alfa Romeo under Jano was the P2 Grand Prix car, which won Alfa Romeo the inaugural world championship for Grand Prix cars in 1925. For road cars Jano developed a series of small-to-medium-displacement 4-, 6-, and 8-cylinder inline engines based on the P2 unit that established the architecture of the company’s engines, with light alloy construction, hemispherical combustion chambers, centrally located plugs, two rows of overhead valves per cylinder bank and dual overhead cams. Jano‘s designs proved both reliable and powerful. 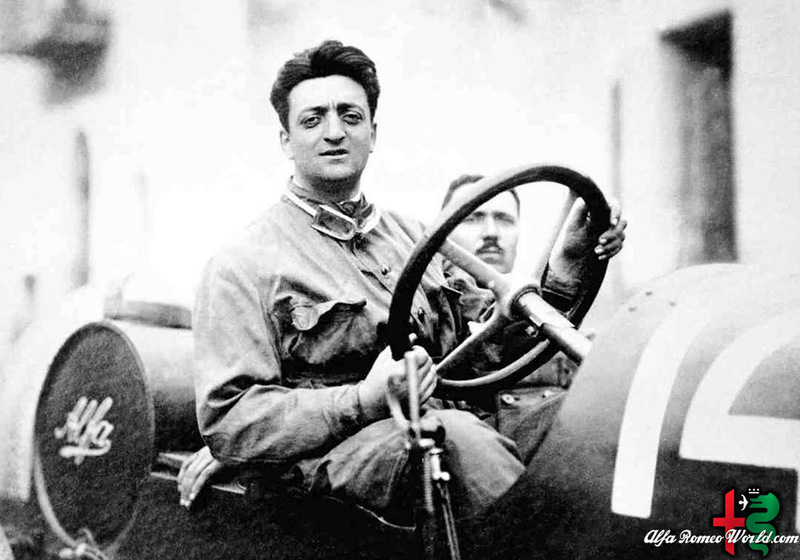 Enzo Ferrari proved a better team manager than driver, and when the factory team was privatised, it became Scuderia Ferrari. 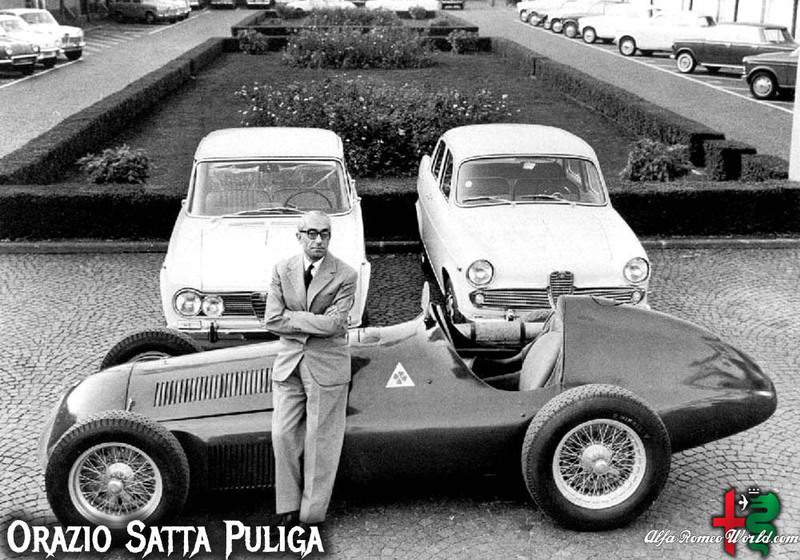 When Ferrari left Alfa Romeo, he went on to build his own cars. 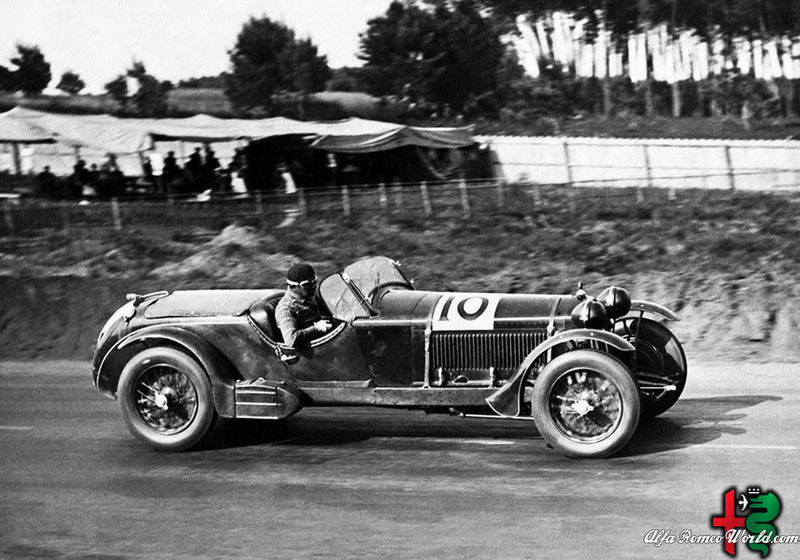 Tazio Nuvolari often drove for Alfa, winning many races before the Second World War. 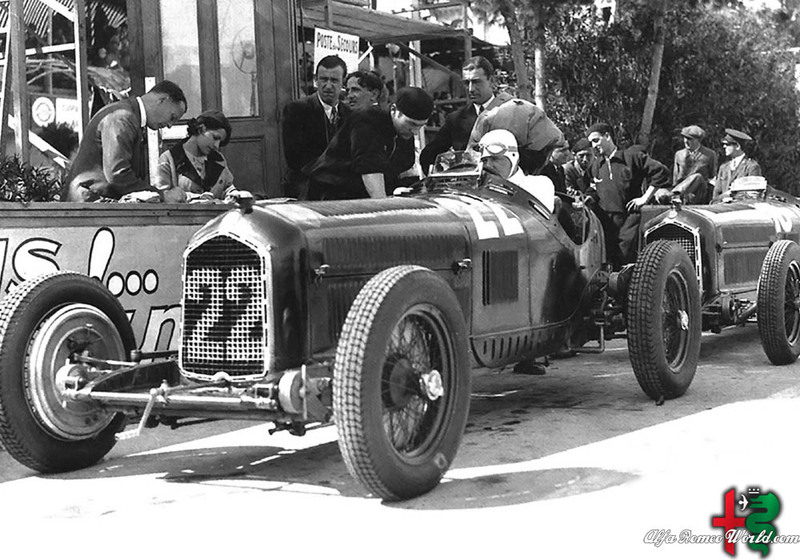 In 1928 Nicola Romeo left, and in 1933 Alfa Romeo was rescued by the government, which then had effective control. 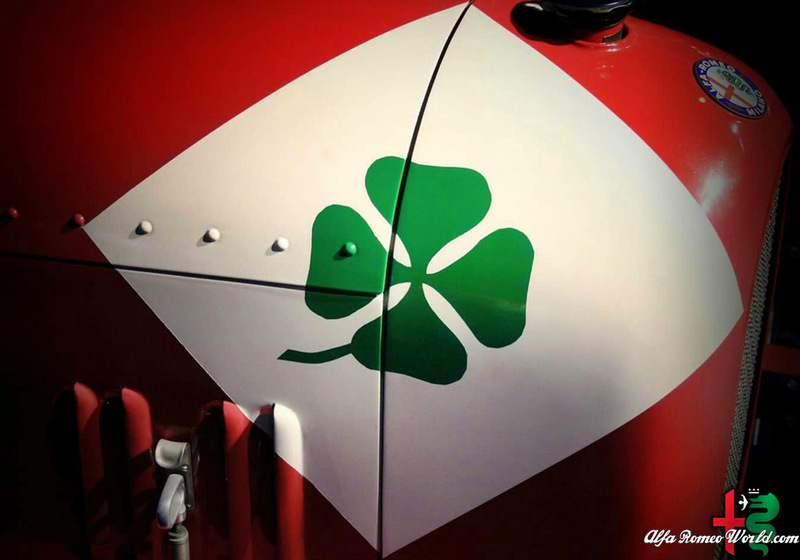 Alfa Romeo became an instrument of Mussolini’s Italy, a national emblem. During this period it built bespoke vehicles for the wealthy, with bodies normally by Touring of Milan or Pininfarina. This era peaked with the Alfa Romeo 2900B Type 35 racers. Alfa Romeo enjoyed a period of great popularity, with internationally famous iconic models and racing success that appeared to be unstoppable. Added to this was the production of new aeronautical engines and industrial vehicles. 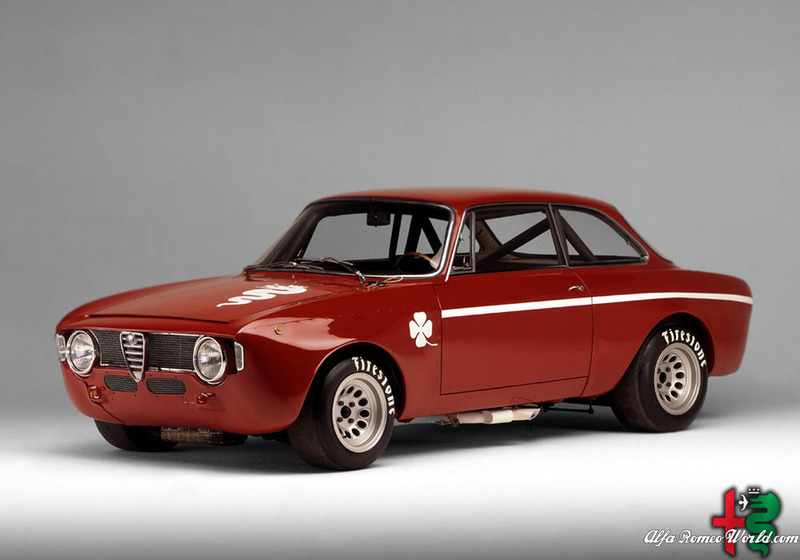 Alfa Romeo enjoyed a period of great popularity, with internationally famous iconic models and racing success that appeared to be unstoppable. Added to this was the production of new aeronautical engines and industrial vehicles. However, undermined by the global crisis, the economic situation again became very difficult. In 1933, weighed down by debts, Alfa Romeo was purchased by the IRI, the state-owned Institute for Industrial Reconstruction and a new Director General, Ugo Gobbato, was appointed. Gobbato enjoyed considerable support from the government. He succeeded in turning Alfa into a major organised and efficient industrial company, able to produce cars, aircraft engines and heavy duty vehicles. In 1935, the company was militarised and in 1939 the first stone was laid for the new factory in Pomigliano d’Arco, near Naples, devoted to aeronautical production. The whole racing area was entrusted to the Scuderia Ferrari and it is from this time that many legendary cars date: 6C 2300, 6C 2500, 8C 2300 and 8C 2900 B. This golden era was followed by the years of Second World War. The Alfa factory (converted during wartime to the production of Macchi C.202 Folgore engines: the Daimler-Benz 600 series built under license) was bombed during the Second World War, and struggled to return to profitability after the war. The luxury vehicles were out. Smaller, mass-produced vehicles began to be produced beginning with the 1954 model year, with the introduction of the Giulietta series of berline (saloons/sedans), coupes and open two-seaters. All three varieties shared what would become the Alfa Romeo overhead Twin Cam four-cylinder engine, initially 1300cc. 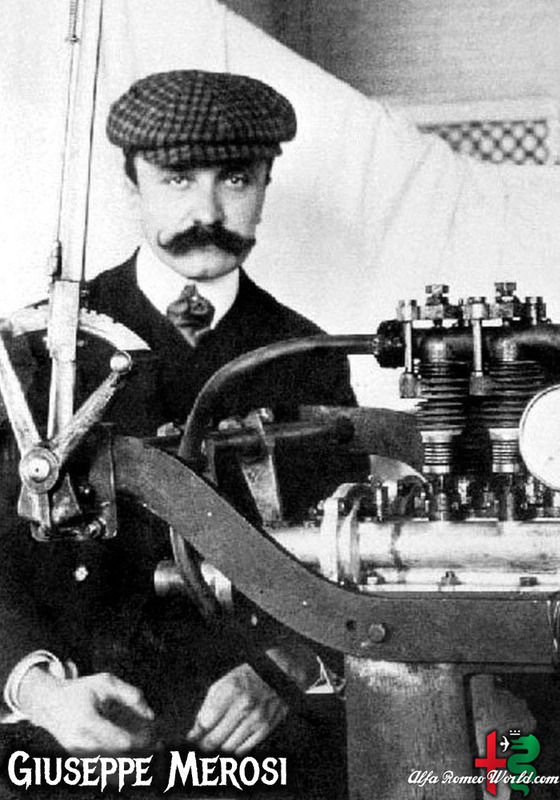 This engine would eventually be enlarged to 2000cc and would remain in production until 1995. In 1945, Gobbato was murdered and the task of demilitarising Alfa Romeo was entrusted to Pasquale Gallo. Meanwhile, Orazio Satta Puliga and his team took over management of the design department. Production slowly started up again, but it was by then clear that the company could no longer continue to make elitist and hand-crafted cars and would have industrialise its production. 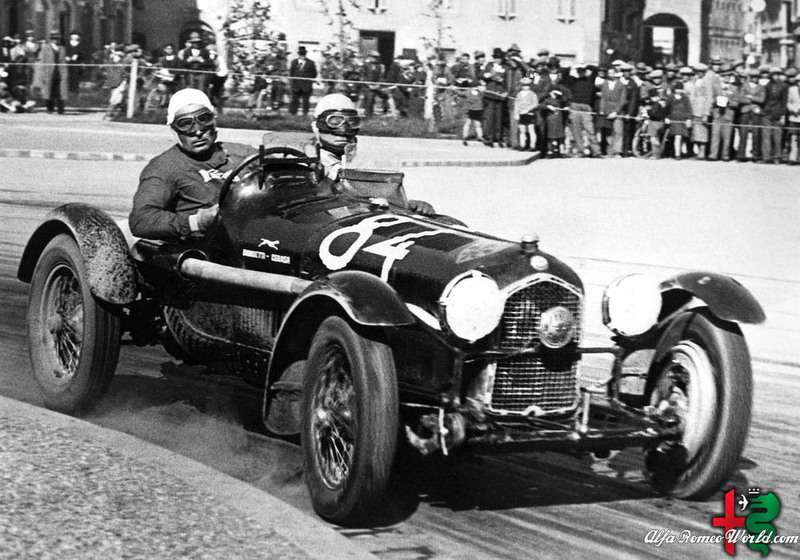 Once motor sports resumed after the Second World War, Alfa Romeo proved to be the car to beat in Grand Prix events. The introduction of the new formula (Formula One) for single-seat racing cars provided an ideal setting for Alfa Romeo‘s Tipo 158 Alfetta, adapted from a pre-war voiturette, and Giuseppe Farina won the first Formula One World Championship in 1950 in the 158. 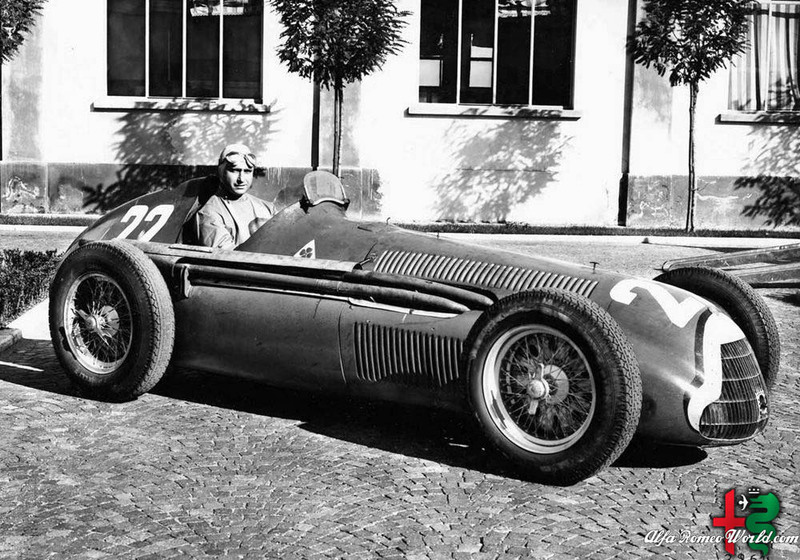 Juan Manuel Fangio secured Alfa‘s second consecutive championship in 1951. 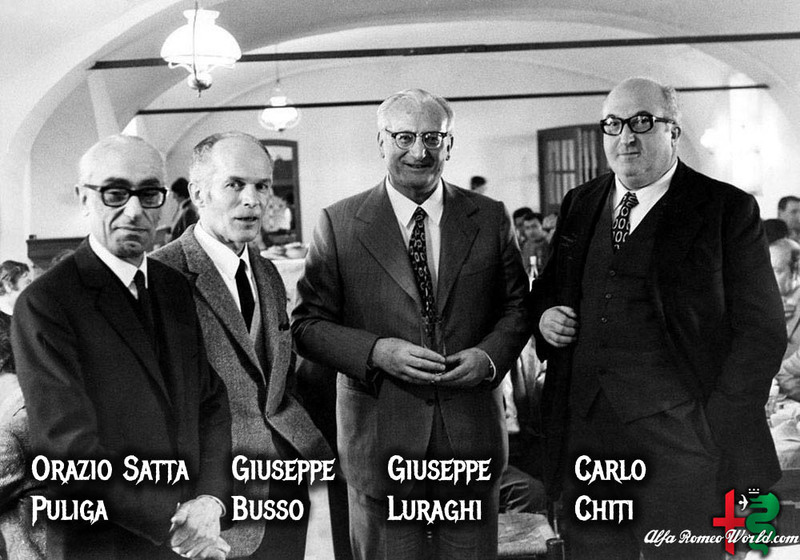 And at the beginning of the Fifties, Giuseppe Luraghi joined the top management of the company, where he would remain until 1974. 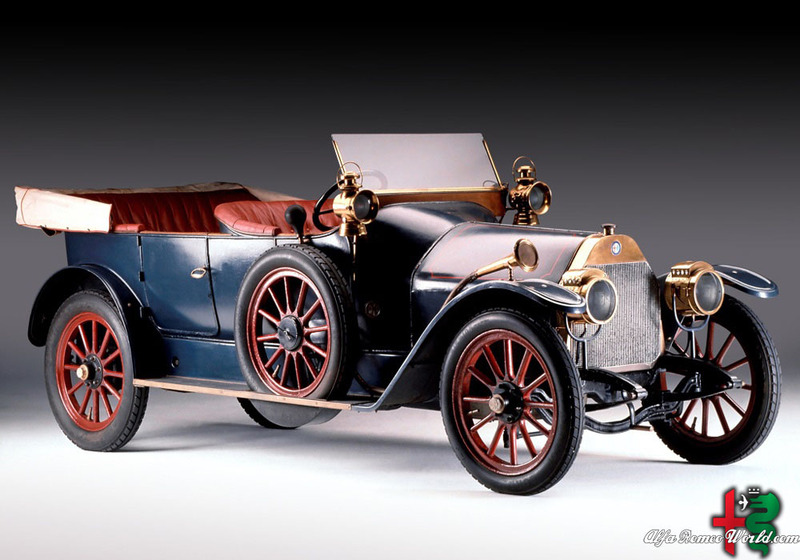 The 1900 made its début on the market, the first car produced without a separate chassis and made on an assembly line. In 1952, Alfa Romeo experimented with its first front-wheel drive compact car, “Project 13-61”. It had the same transverse-mounted, forward-motor layout as the modern front-wheel drive automobile. Alfa Romeo made a second attempt toward the late 1950s based on Project 13-61. It was to be called Tipo 103 and resembled the smaller version of its popular Alfa Romeo Giulia. However, due to the financial difficulties in post-war Italy, the Tipo 103 never saw production. Had Alfa Romeo produced it, it would have preceded the Mini as the first “modern” front-wheel drive compact car. In the mid-fifties, Alfa Romeo entered into an agreement with Brazil’s Matarazzo Group to create a company called Fabral (Fábrica Brasileira de Automóveis Alfa, “the Brazilian Alfa automobile factory”) to build the Alfa Romeo 2000 there. During the 1960s, Alfa Romeo concentrated on competition using production-based cars, including the GTA (standing for Gran Turismo Allegerita), an aluminium-bodied version of the Bertone-designed coupe with a powerful twin-plug engine. Among other victories, the GTA won the inaugural Sports Car Club of America’s Trans-Am championship in 1966. 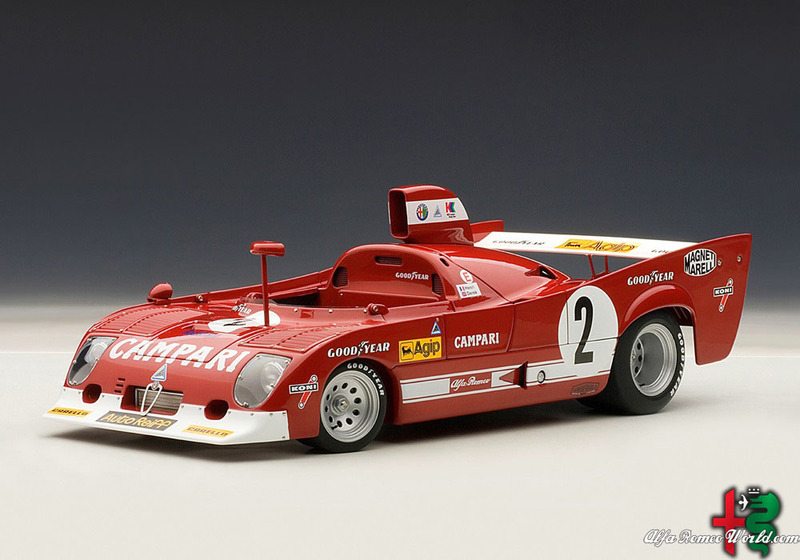 In the 1970s, Alfa Romeo concentrated on prototype sports car racing with the Tipo 33, with early victories in 1971. Eventually the Tipo 33TT12 gained the World Championship for Makes for Alfa Romeo in 1975 and the Tipo 33SC12 won the World Championship for Sports Cars in 1977… And in these years the Giulietta and Giulia models would bring unexpected growth to Alfa Romeo, with an image return beyond all prediction. By the 1970s, Alfa Romeo was again in financial trouble and creative measures were attempted to shore it up, including an ultimately unsuccessful joint venture with Nissan endorsed by Ettore Massacesi of Alfa Romeo‘s parent company, the Italian-government owned Istituto per la Ricostruzione Industriale (IRI) and Prime Minister Francesco Cossiga. By 1986, IRI was suffering heavy losses, and IRI president Romano Prodi put Alfa Romeo up for sale. Finmeccanica, the mechanical holdings arm of IRI and its predecessors owned Alfa Romeo since 1932. Prodi first approached fellow Italian manufacturer Fiat, which offered to start a joint venture with Alfa. Prodi was initially unsupportive, citing the strained industrial relations between Northern and Southern Italy, with Fiat being based in Turin and Alfa being based in Milan. 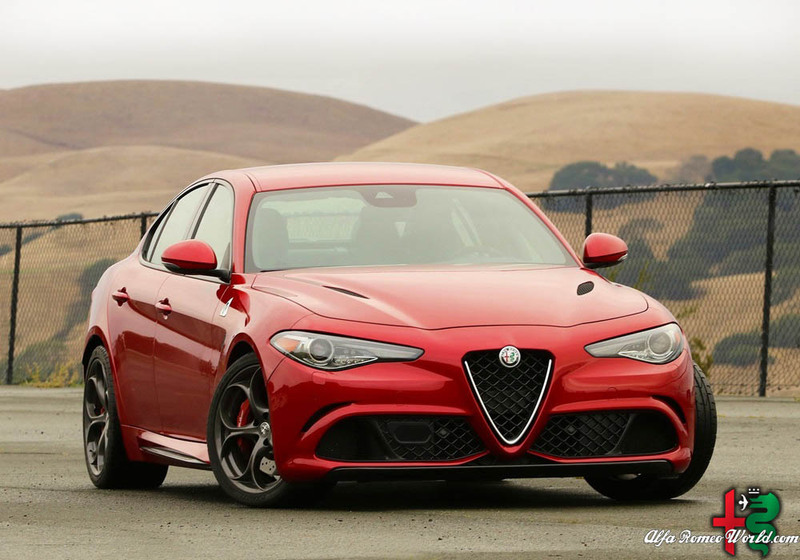 Fiat withdrew its plan for a joint venture when Ford put in an offer to acquire part of Alfa Romeo and restructure the company, while increasing its stake over time. However, Fiat put in a bid to acquire the entirety of Alfa Romeo and offer job guarantees to Italian workers, an offer that Ford was unwilling to match. It also did not hurt any of the parties involved that an acquisition by Fiat would keep Alfa Romeo in Italian hands. In 1986, the deal was concluded with Alfa Romeo merged with traditional rival Lancia into Fiat‘s Alfa Lancia Industriale S.p.A.
Models produced from the 1990s combined Alfa‘s traditional virtues of avant-garde styling and sporting panache with the economic benefits of product rationalisation, and include a “GTA” version of the 147 hatchback, the Giugiaro-designed Brera, and a high-performance exotic called the 8C Competizione (named after one of Alfa‘s most successful prewar sports and racing cars, the 8C of the 1930s). In 2005 Maserati was bought back from Ferrari and under Fiat‘s full control. The Fiat Group plans to create a sports and luxury division from Maserati and Alfa Romeo. There is a planned strategic relationship between these two; engines, platforms and possibly dealers will be shared in some markets. After the war, Romeo invested his war profits in acquiring locomotive and railway carriage plants in Saronno (Costruzioni Meccaniche di Saronno), Rome (Officine Meccaniche di Roma), and Naples (Officine Ferroviarie Meridionali), which were added to his A.L.F.A. ownership. Car production had not been considered at first, but resumed in 1919 since parts for the completion of 105 cars had remained at the A.L.F.A. factory since 1915. 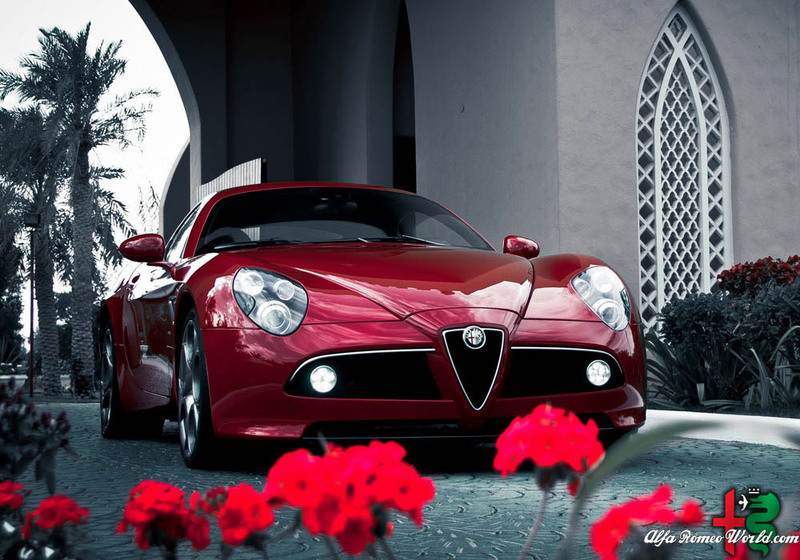 In 1920, the name of the company was changed to Alfa Romeo with the the first car to be so badged. 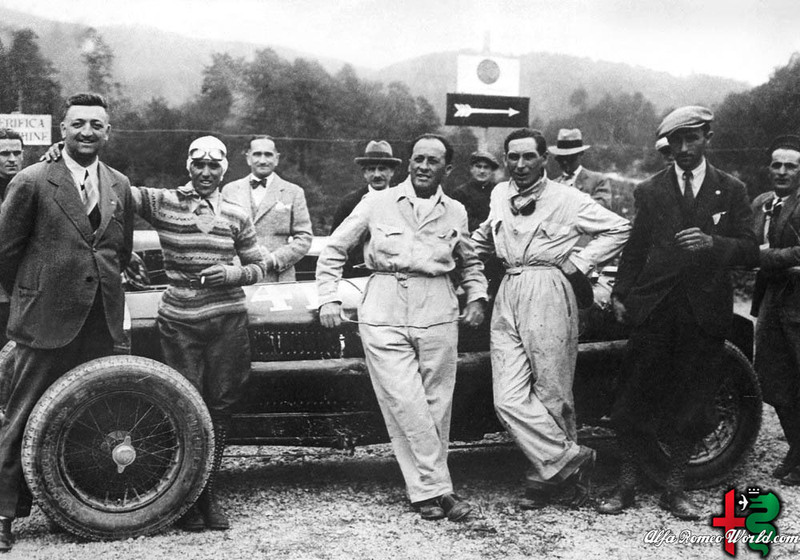 Their first success came in 1920 when Giuseppe Campari won at Mugello and continued with second place in the Targa Florio driven by Enzo Ferrari. 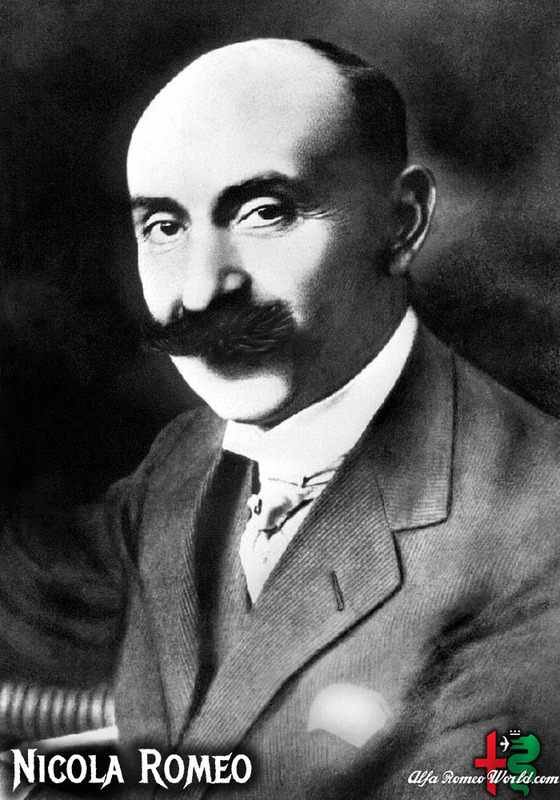 Giuseppe Merosi continued as head designer and the company continued to produce solid road cars as well as successful race cars. with internationally famous iconic models and racing success that appeared to be unstoppable. Added to this was the production of new aeronautical engines and industrial vehicles. However, undermined by the global crisis, the economic situation again became very difficult. In 1933, weighed down by debts, Alfa Romeo was purchased by the IRI, the state-owned Institute for Industrial Reconstruction and a new Director General, Ugo Gobbato, was appointed. Gobbato enjoyed considerable support from the government. He succeeded in turning Alfa into a major organised and efficient industrial company, able to produce cars, aircraft engines and heavy duty vehicles. In 1935, the company was militarised and in 1939 the first stone was laid for the new factory in Pomigliano d’Arco, near Naples, devoted to aeronautical production. company called Fabral (Fábrica Brasileira de Automóveis Alfa, “the Brazilian Alfa automobile factory”) to build the Alfa Romeo 2000 there. After having received government approval, Matarazzo pulled out and under pressure from Brazil’s President Juscelino Kubitschek the state-owned FNM company instead commenced building the car as the “FNM 2000” there in 1960.
prototype sports car racing with the Tipo 33, with early victories in 1971. Eventually the Tipo 33TT12 gained the World Championship for Makes for Alfa Romeo in 1975 and the Tipo 33SC12 won the World Championship for Sports Cars in 1977… And in these years the Giulietta and Giulia models would bring unexpected growth to Alfa Romeo, with an image return beyond all prediction.